Fig 1. 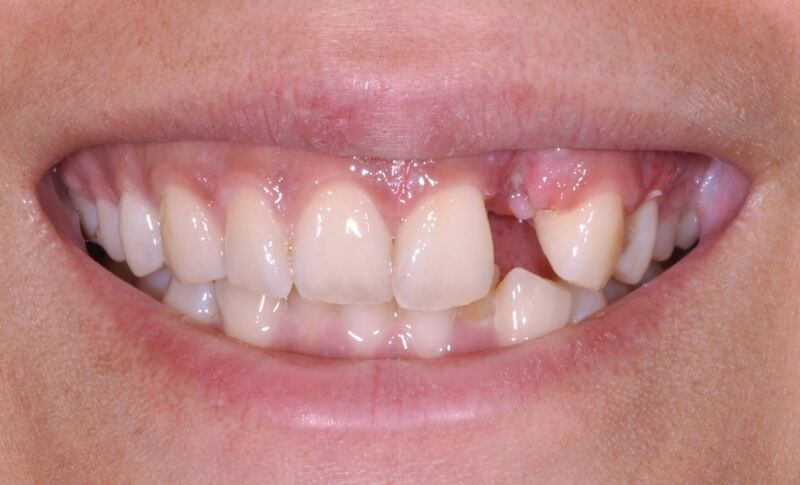 19-year old patient with high smileline prior to implant placement. In earlier decades when implant treatment was less explored the dentist and the patient were satisfied with the implants being osseointegrated to enable loading with a prosthetic reconstruction. 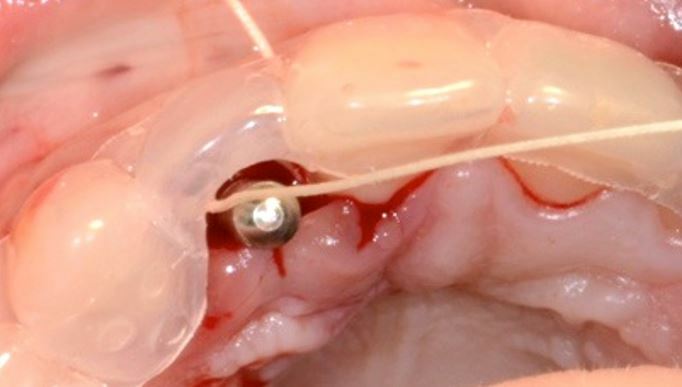 Today we know that patients, in need of especially frontal implants, not only wants a new tooth to chew with but also a natural looking tooth in a good positon. I also always strive towards making a screw retained reconstruction. In order to reach an optimal result both esthetically, functionally and hygienic we need to have a good multidisciplinary teamwork between dental technician, surgeon and prosthodontist. Today we have good tools for communication between these disciplines. We have digital planning programs for implant placement (fig 2) and we also have less sophisticated but still very good simple acrylic guides (fig 3). Today we talk about prosthetically driven implant treatments or “crown down” planning of our implant treatments. This means that the planning needs to start from where we want the implant crown to end up and according to that we plan the placement of the implant in the bone. Sometimes we have enough bone volume and sometimes the patient needs to go through bone augmentation procedures to increase our possibilities to place the implant crown in the correct position. 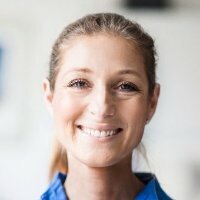 With this short text I would like to encourage more dentists working with dental implants to work with a more predictable treatment protocol by communicating with your implant team (dental technician, prosthodontist and surgeon) through using surgical guides. It starts with the dental technician waxing up where the future crown is supposed to end up. By showing the planned position of the crown to the surgeon with the help of a surgical guide and by using the guide at the placement of the implant the treatment becomes predictable. Both for the implant team and the patient. We thereby make our work both easier, more pleasurable and we will reach better treatment results (fig 4). All for the benefit of the patient. This might sound obvious but out in the clinic many cases are being treated without the different dental professionals understanding how they should work together to get a good end result. The key is to find an effective work flow including surgical guides that can be viable to many implant teams and patients all over the world. A well planned and performed case is of course very important in all implant cases but maybe it is of extra importance that the treatments with anterior implants in young patients are well planned and performed due to the great amount of challenges to consider (mentioned above) specifically in these cases. Or how would you like your son or daughter to be treated? Fig 4. Result of 19-year old patient with aplasias 12, 22. 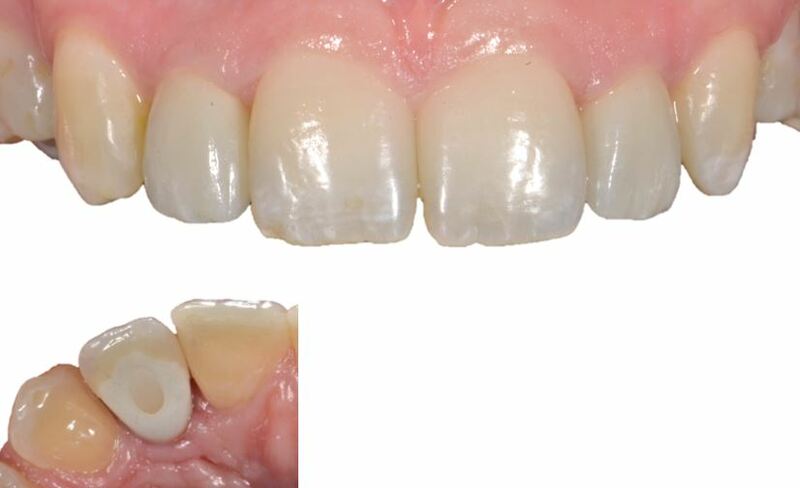 Result with screw retained zirconia crowns through successful collaboration. Simple surgical guide was used. Jemt T, Ahlberg G, Henriksson K, Bondevik O. 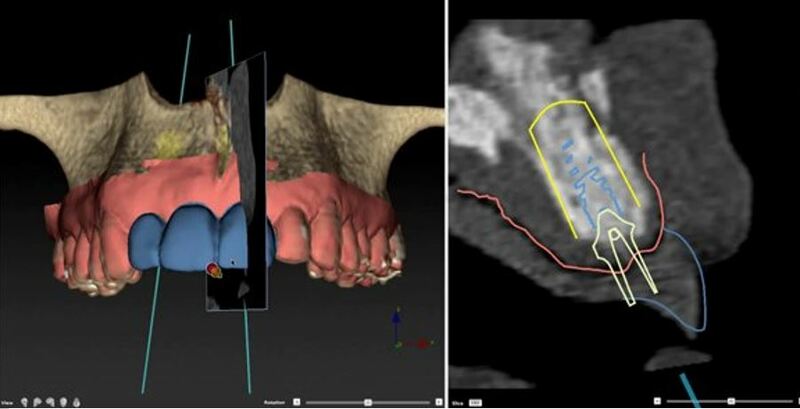 Changes of anterior clinical crown height in patients provided with single-implant restorations after more than 15 years of follow-up. Int J Prosthodont. 2006; 19:455-461. Thilander B, Odman J, Grondahl K, Friberg B. Osseointegrated implants in adolescents. An alternative in replacing missing teeth? Eur J Orthod. 1994; 16:84-95. Thilander B, Odman J, Jemt T. Single implants in the upper incisor region and their relationship to the adjacent teeth. An 8-year follow-up study. Clin Oral Implants Res. 1999; 10:346-355. Oesterle LJ, Cronin RJ, Jr. Adult growth, aging, and the single-tooth implant. Int J Oral Maxillofac Implants. 2000; 15:252-260. Agarwal N, Kumar D, Anand A, Bahetwar SK. Dental implants in children: A multidisciplinary perspective for long-term success. Natl J Maxillofac Surg. 2016; 7:122-126.